Who says that little girls are made of "sugar and spice and everything nice?" Or that boys are made of "frogs and snails and puppy dog tails?" What if girls were made of "boats and snails and dinosaur tails?" And little boys of "flowers and swings and bumblebee wings?" When the traditional rhyme just doesn't seem to fit the boy and girl visiting their grandpa, he comes up with a list of unusual alternatives. Soon the children are coming up with their own versions that challenge the old stereotypes with a whimsical list of ingredients. To add to the new quirky version are lively illustrations that beautifully capture the children's imaginative flights of fancy. 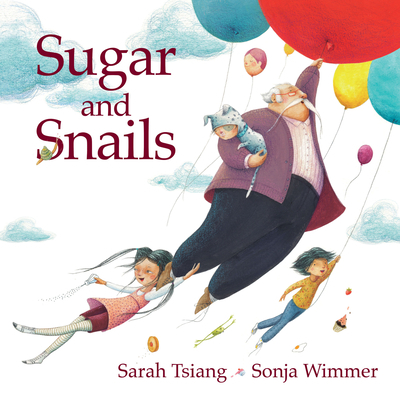 Young readers will delight in the small details of Sonja Wimmer's vibrant art, and be inspired to think of their own silly examples of what ingredients they might be made of themselves.